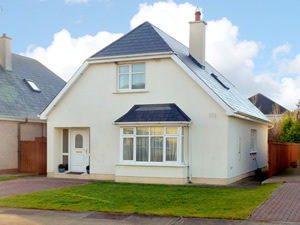 Located in a quiet enclave in the centre of Rosslare Harbour is this fabulous home which is only a stone's throw from the Rosslare Port. Offering large comfortable rooms and open bright living space this is the perfect holiday base with all amenities and beach within walking distance. There are a host of activities; from a superb 18-hole golf course to a fabulous sandy beach, there is something for everyone. The beautiful coastline is on the doorstep, with many little beaches and coves to discover. There is so much to see and do that you will want to return time after time.Shop. Pub. Restaurant 440 yards. Beach 900 yards. GF: lounge, kitchen/diner, double with ensuite shower room. FF: double (2 x double beds), adult bunk with single, bathroom with shower over bath.Electricity and oil central heating included, open fire with starter pack, linen and towels included, high chair, travel cot, stair gate, TV, dvd player, CD, freezer, microwave, dishwasher, w/machine, games console, internet access, hairdryer, alarm clock, uk tv channels, welcome pack, open plan garden, garden furniture, bbq, off road parking. Sorry no pets.